Do you girls remember the belt it way I wore my blanket scarf in this prior post I did a while ago? Today I'm belting a regular size plaid scarf. It's still one of my favorite ways to wear a scarf. This is an outfit I wore while it was snowing in New York City last week. 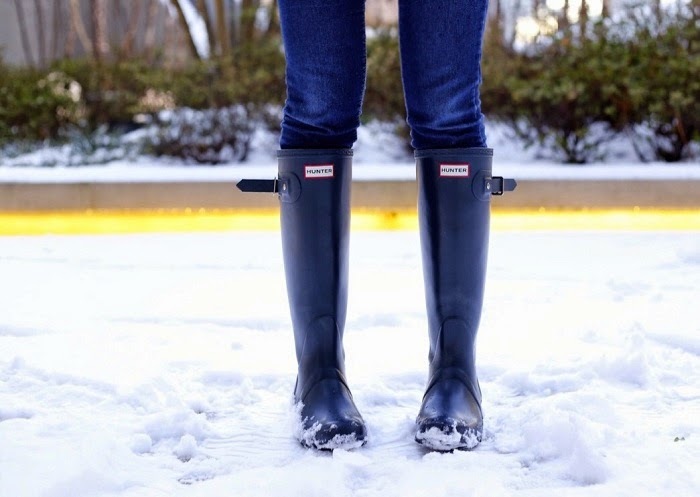 Hunter boots, jeans and sweater dresses are my best friends for snowdays in the city. This new sweater dress from Tobi is super cute and cozy. Love how you belted the sweater and scarf! You look great! The belt definitely finish up this looK! Wow, such a cute outfit. I love the Hunter boots with it! love the sweater and the scarf! great look! This is a really cool way to style and incorporate a scarf into your outfit! you look great! loving this outfit! Such a great winter look! Such a cute look!! Looks so warm and cozy!! I love this outfit! The sweater/scarf combo is perfect! LOVE love this from head to toe! So cozy and that sweater is a must have!